We love flowers, we love fruits and if after the long, long winter everything starts to blossom and bloom, our mood is cheerful and happy. And if there are not only flowers, but fruits - then the first crop can be harvested. If we are lucky and our balcony or garden is on the sunny side, than it is the time that the first strawberries are eaten right where they grow. To have this wonderful feeling of freshly picked strawberries a little longer, we decorate from may on everything with strawberries and you can see them on cushion, fabric and wherever we find place for them. 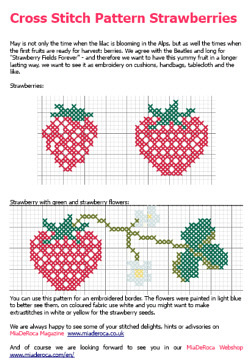 If you want to have some strawberry decoration delight as well, we made a cross stitch pattern for you with this nice fruit. You can apply this cross stitch onto table cloth, but as well in bigger size onto self sewn handbags and shoulderbags. And the best thing about it, these strawberries are perfect for anyone with allergies.